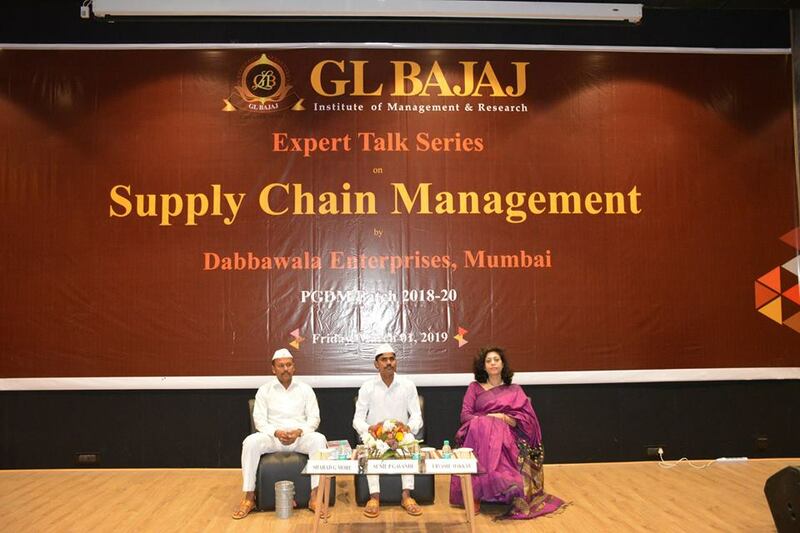 GLBIMR organized Special Session on Supply Chain Management under Expert Talk Series by Dabbawala Enterprises, Mumbai on March 01, 2019 under the visionary leadership of Mr. Pankaj Agarwal, Vice Chairman, GL Bajaj Educational Institutions and Dr. Urvashi Makkar, Director General, GLBIMR. The guests of the event were Mr. Sunil P Gavande, Director & COO and Mr. Sharad G More, Director & CEO, Dabbawala Enterprises Pvt. Ltd, Mumbai. Dr. Urvashi Makkar, while welcoming Expert Speakers, shared that the main objective of providing these opportunities, was to apprise the young minds to understand about applications of basic principles of People Management, Sustainable Relationship Development, Customer Satisfaction and thirst to serve customers in a simple yet effective fashion. She also apprised the students with the unique management exhibited by Dabbawala Enterprises, Mumbai, in the field of 'Time Management' and 'Supply Chain Management' leading to Zero Mistake by application of Six Sigma in delivering the Dabbas. The presentation by Mumbai Dabbawala was humorous and everyone enjoyed it. It was not just a session but experience sharing that fascinated the students. The proceeds of the event would be donated to the charity run by Dabbawala Enterprises Ltd for the welfare of Dabbawalas. The discussion ended up with valedictory of the guests and vote of thanks. The students left the session more wise and matured while being highly inspired.